iOS is the operating system powering iPhones and iPads. To develop apps that run on iOS, you need to work with the Swift or Objective-C coding language and the Cocoa API. However, working with Swift, Objective-C and Cocoa is just one piece of iOS training. iOS training also teaches you how to work with the Xcode IDE, how to get your app submitted to the App Store and more. iOS training is training worth taking, because it takes you through the whole process of producing a real app. Here are some of Code Conquest’s top iOS training recommendations. There’s something from every category – free and premium, online and offline, basic and extensive, hands-on and theoretical. Guaranteed, one is the perfect training for you. Important: You need a Mac to develop iPhone and iPad apps. This is because the Xcode IDE only runs on the Mac. Treehouse has two tracks for iOS Development. iOS Development with Swift covers the Swift programming language and iOS Development with Objective-C uses the original iOS programming language, Objective-C. These are both important topics as you will certainly want to learn Swift since it is the new development language for iOS, however, it is important to know Objective-C as you will no doubt encounter code written in this language as well. This track really emphasizes the ease in which it is to develop iOS applications using Swift and Xcode. Coming from Objective-C, this is certainly the case. If you are just starting out, there is always a learning curve, but the interactive playground is a great tool for “playing” and learning the language. The track opens with an introduction to the language you’ll be using to make iPhone and iPad apps, Objective-C. This is followed by several iPhone app projects – a ‘crystal ball’ app, a blog reader app and a self-destructing message app. The good news is that you have the opportunity to learn how to make the exact same apps for Android too – a skill mobile app developers need to master. The first topic, Try Objective-C, is free. It doesn’t cover how to build apps, but focuses on the coding language behind them. Once you have these foundational skills, you’ll then learn how to build an app and integrate it with Apple Maps. Building a Note-Taking App for iOS is part of a matched set of mobile app development courses in the lynda.com library. The training walks you through how to make a note-taking app for the iOS platform. It covers iOS specifics, working with Xcode, adding an icon, creating a data model and creating a user interface. While this particular course focuses on building the app for iOS, its two sister courses cover how to make the same app for Android and Windows Phone 8. For this reason, this training is a good choice if you want to make multi-platform apps. 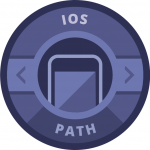 Part of the Treehouse book series, iOS 6 Foundations is a practical, step-by-step guide to creating your very own app that runs on iOS 6. The book is very much design-focused, featuring full-color graphics and teaching you how to create attractive and eye-catching apps. This is the book for you if you’re a visual learner. It’s available in paperback and Kindle editions. iPhone App Development: The Missing Manual takes a big-picture approach to developing iPhone apps. It’s an easy-to-follow guide that walks you through the entire process, from sketching your idea to building a customer base. This is the book for you if you’re not just interested in learning to code an app, but how to design and market your creation too. It’s available in paperback and Kindle editions. The iOS Dev Center is Apple’s official online resource for iOS developers. There are starter guides, tutorials, videos and documentation. All the content is free of charge, however some parts of the website require you to log in with an Apple ID.